Sometimes what I decide to make is buy pure happenstance. At the end of last school year, I was on the PTO board for the junior high and we hosted a teacher luncheon. It was catered, in part, by a local barbecue restaurant and they had this GIANT tray of sliced onions leftover at the end. As someone was about to toss the tray into the trash, I stopped them and wrapped it up in foil and took it home. They had barely been touched and I ended up filling up TWO gallon size bags of the onions and put them in my freezer. Admittedly, I kind of forgot about them over the summer as they were on a bottom shelf of the freezer behind some other items. 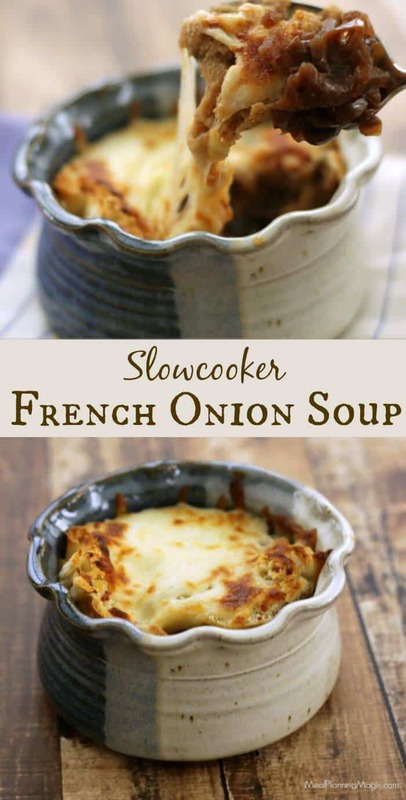 So when I rediscovered them a few weeks ago I knew the perfect way to use them up—with a delicious slowcooker French Onion Soup. I have made this soup before and not only is it so simple, it’s also a family favorite (ok, by all but one member of my family—my son is not a super-fan but he will eat it). 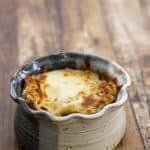 Y’all, this really is the easiest recipe and it’s so delicious as a side dish to a main meal or as a vegetarian meal option. The original recipe called for white wine but I didn’t have any on hand so used red wine instead. When I did make it another time with white wine, we decided we liked it better with the red wine–it just seems to have a deeper flavor. So it’s totally up to you and what kind of wine you might have on hand. We actually don’t drink a whole lot of wine so I like to buy the little mini-bottles at the grocery store. I think they’re just about a dollar or so each and there’s rarely any waste–or if there is, I go ahead and drink it! 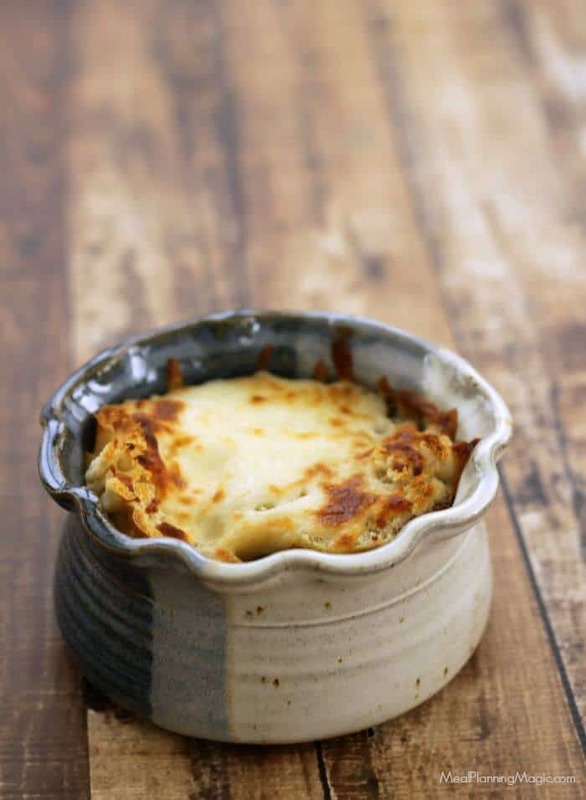 To make it extra special, you can use some crusty day-old baguette and top it with some of the cheese before putting it under the broiler to get it nice and golden brown and bubbling. It’s as good as any restaurant version I’ve ever had! 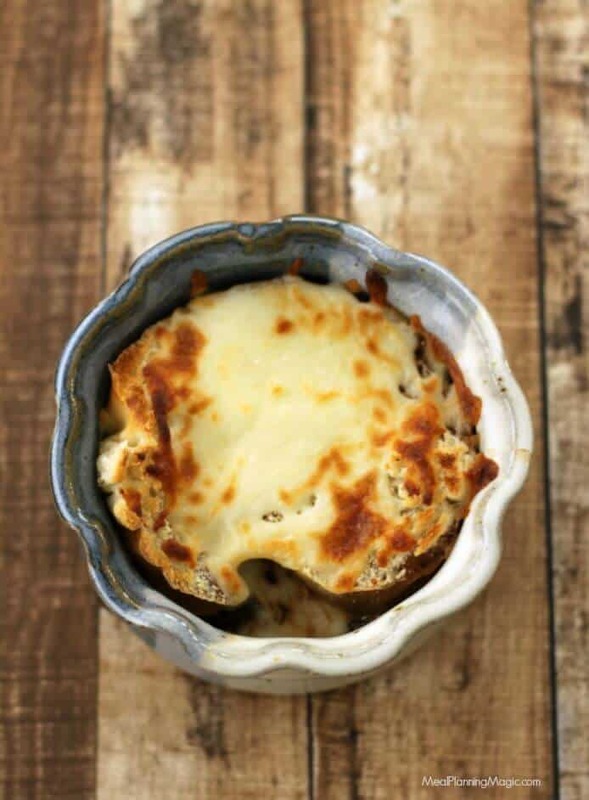 And I don’t know about you, but even though the fall weather is just around the corner and may put you in the mood for soup, French Onion Soup is something I can pretty much enjoy year round! 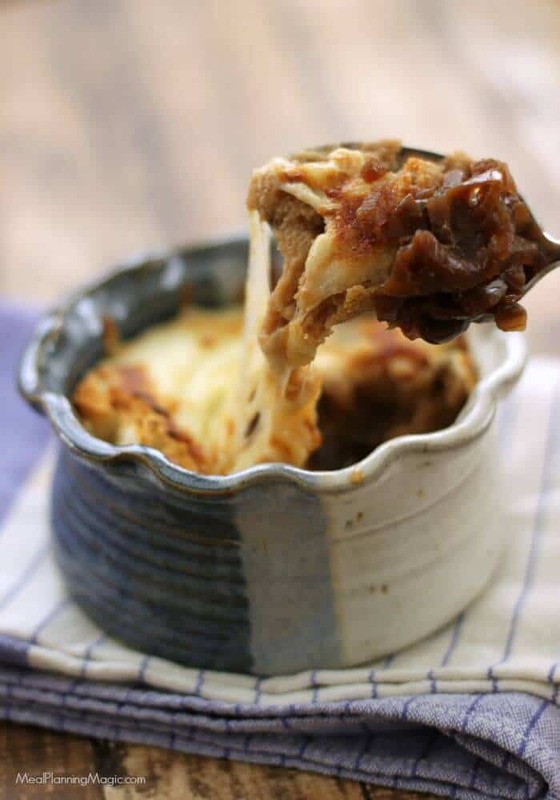 Making Slowcooker French Onion Soup in the slowcooker is SO easy and the results are delicious! This version only has seven ingredients total! In a large skillet, melt butter over medium to low heat. Add onions and cook just until onions are limp and transparent but not brown, about 10 minutes, stirring frequently. Sprinkle sugar over onions and cook, stirring until onions are brown and caramelized, about 8-10 minutes. Transfer onions and any brown bits into 6 quart slowcooker. If desired, add wine to skillet and return to the heat. Bring wine to a boil, scraping any brown bits with a non-stick spoon or spatula. Transfer wine to slowcooker with onions and add beef broth. Cover and cook on HIGH 6 hours or LOW for 8 hours. *I have made this soup with both white and red wine and they are both delicious. We found using the red wine gave the soup a richer taste but the white wine was also yummy. Just use what you have on hand! When is beef broth added? It’s not stated in recipe. Hi Maria! 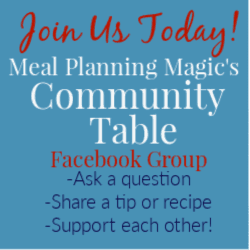 I updated the recipe to add that–thanks for the catch! You add the beef broth to the slowcooker just before you set it to cook for the 8 hours. Hope you enjoy the soup. That sounds good too! I will have to give one of those a try.